Bobby Short, the cherubic singer and pianist whose high-spirited and probing renditions of popular standards evoked the glamour and sophistication of Manhattan nightlife, liked to call himself a saloon singer. His “saloon” from 1968 to 2005 was one of the most elegant in the country, the intimate Cafe Carlyle in the Carlyle Hotel on the Upper East Side of Manhattan. There for six months each year, in a room where he was only a few feet from his audience, he sang and accompanied himself on the piano. 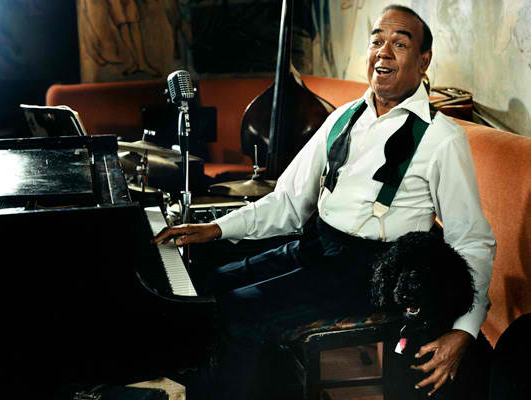 Over the years, Short transcended the role of cabaret entertainer to become a New York institution and a symbol of civilized Manhattan culture, attracting a chic international clientele that included royalty, movie stars, sports figures, captains of industry, socialites, and jazz aficionados. In Woody Allen’s films a visit to the Carlyle became an essential stop on his characters’ cultural tour—including a memorable scene in Hannah and her sisters that featured Short. This according to “Bobby Short, icon of Manhattan song and style, dies at 80” by Enid Nemy (The New York times, 21 March 2005). Today would have been Short’s 90th birthday! Below, the Hannah sequence.